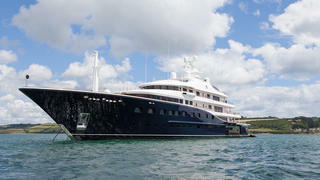 The 85.6 metre superyacht Aquila has completed a 12-month overhaul at Pendennis. 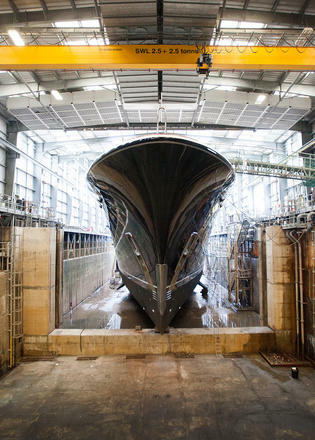 As well as being the largest yacht built in the USA, she is now the largest yacht to be refitted in the UK to date. Adrian Tinkler, fleet technical manager at Burgess who provided yacht management, hailed this project as a “remarkable rebirth”, adding: “Thanks to efficient planning and collaboration between the many hundreds of people involved at each stage of the design, specification and execution phases, the team delivered on time.” One of the top 200 largest yachts in the world, Aquila will now join the Burgess fleet of yachts for charter. 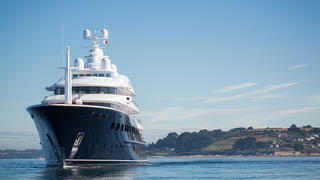 The 85.6 metre superyacht Aquila has completed a 12-month overhaul at Pendennis. As well as being the largest yacht built in the USA, she is now the largest yacht to be refitted in the UK to date. 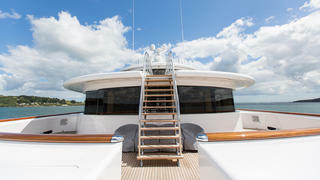 One of the top 200 largest yachts in the world, Aquila will now join the Burgess fleet of yachts for charter. Launched by the Derecktor shipyard in 2010 under her original name Cakewalk, Aquila was due for her five-year service when she arrived in Falmouth last year, but Pendennis was given a much broader remit for this project. While her dark blue hull finish and Tim Heywood exterior design were maintained, there were many external changes including the addition of a private deck area measuring 60 square metres and the repositioning of the superyacht spa pool to the forward sun deck. Launched by the Derecktor shipyard in 2010 under her original name Cakewalk, Aquila was due for her five-year service when she arrived in Falmouth last year, but Pendennis was given a much broader remit for this project. While her dark blue hull finish and Tim Heywood exterior design were maintained, there were many external changes including the addition of a private deck area measuring 60 square metres and the repositioning of the superyacht spa pool to the forward sun deck. 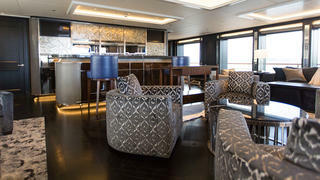 As part of the extensive refit on Aquila, her original Liz Dalton interiors were stripped out and replaced by a new design courtesy of Redman Whitely Dixon. “To facilitate the extent of design and technical changes required, the interiors on Aquila needed to be stripped back to bulkheads across most areas,” Tinkler added. Her internal spaces were reformulated to improve the flow between each area, with the installation carried out by Germany-based interior specialists Metrica. It was not just the social areas that were given an overhaul, however, with Pendennis overseeing work on a grand total of 750 square metres of internal spaces. Most significant of these is the owner’s suite, and although pictures of this private area have not yet been released, the yard explains that it has been completely reconfigured as part of the Aquila refit. The patterning of the parquet wood floor mirrors the ceiling detail in the owner’s saloon, while bespoke furniture and meticulous atmospheric lighting design compliment the look. It was not just the social areas that were given an overhaul, however, with Pendennis overseeing work on a grand total of 750 square metres of internal spaces. Most significant of these is the owner’s suite, and although pictures of this private area have not yet been released, the yard explains that it has been completely reconfigured as part of the Aquila refit. The patterning of the parquet wood floor mirrors the ceiling detail in the owner’s saloon, while bespoke furniture and meticulous atmospheric lighting design compliment the look. The technical aspect of any refit is crucial, and Aquila is no exception, with Pendennis giving her a through overhaul. Her four generators were completely rebuilt, while other upgrades included new AV and IT systems, radar equipment, air conditioning and fresh air handling systems. 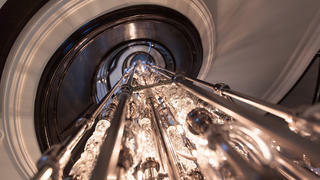 A major addition that adds to Aquila’s wow factor is a brand new glass chandelier by Susan Young. Comprising of more than 850 pieces of hand-blown glass, this magnificent centrepieces cascades 11.2 metres through four of Aquila’s five decks.